The ASTROLOGICALENDAR is a new way of contemplating the passage of time with a beautiful, open layout that allows you to astrologically schedule your earthly agenda. The monthly grid aligns with the movements of the tropical Zodiac. 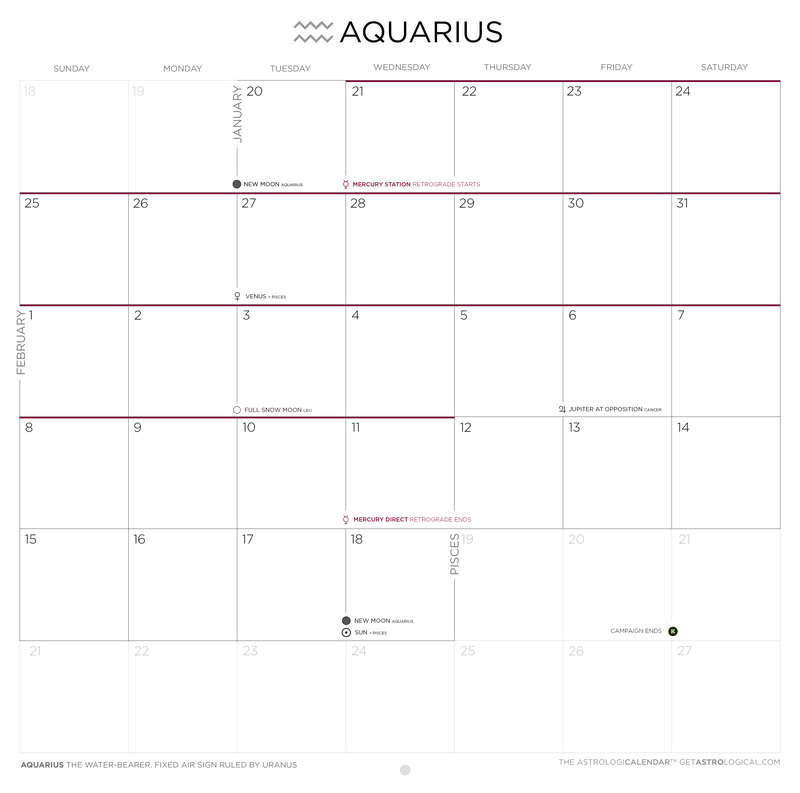 It begins on March 21st, 2015 for Aries, and ends on March 20th, 2016 with the last day of Pisces. Instead of holidays, it highlights celestial changes: when planets move between the signs of the zodiac, meteor showers, solstices, eclipses, and equinoxes too. And let's be honest: if you know my family, you know that the Summer Solstice is the most sacred holiday of the year! But perhaps most importantly— it illustrates planet retrogrades! With the ASTROLOGICALENDAR you'll always be prepared for the influence of Mercury's shifting path. Each month of the zodiac features an aerial photograph I've taken over the last two years, superimposed with the stars and a chart for that sign's corresponding constellation in the sky. These impressions are like a view of the earth from that sign, which is my interpretation of what astrology can help us to understand — how the light of certain stars along with sunlight signify and illustrate changes on Earth. Updated! Here's a preview of the final images that will accompany each sign. A few may still change a bit as they are color corrected and go to press, but I'm very excited about the final set of images! The best option right now to get a copy of the ASTROLOGICALENDAR is by pledging today. And since we've have already been fully funded (in less than 24 hours!) your pledge rewards today are guaranteed to be fulfilled! I would love to send those who pledge $25 or more the first edition as well as a hand written note of thanks! I will also thank everyone who pledges by printing your name (if you like) into the credits of the calendar! For anyone who would like to give them as gifts or sell them in a storefront, there are rewards that provide you with 2, 5, or 10 calendars. These are for you! Showcase and be inspired by your sign's constellation with these limited edition, watercolor giclée art prints. They'll be printed on gorgeous heavy art paper with a subtle texture, signed, and sent ready for framing. Available in both the AstroPrint (12") and AstroPrint Plus (20"). I will work with you to develop a custom and personalized version of the ASTROLOGICALENDAR. This will be a very, very limited edition, custom printed run just for you and a few of your friends and family! If you would like to spare no expense, I have dreamed of a once in a lifetime aerial photography workshop. You'll be generously helping to fund my plans to dig in and to really Get Astrological for ... a further three years! Achieved! I will develop a companion website and deliver a monthly email newsletter to complement your printed wall calendar. It will feature my commentary and additional information and research I've collected but didn't find a proper spot for on the calendar. "I never thought I could be this excited about a calendar!" "This is a great idea! I really liked it and I thought it would look good in my office, I'm actually a tarot card reader and I'm always looking for cool stuff to put up!" "I was actually looking for a cool calendar (which is very hard to find in the calendar world), and I was going to write in astrological info myself. So your calendar is perfect for what I was looking for!" "I HAD to buy your calendar. I'm not a zodiac-expert but I really like the idea! It's original, and your photos looks really beautiful." "I wish I had enough cash to donate the $10k and have that awesome adventure with you!" "I myself have been interested in horoscopes for awhile but not seriously. What really got me to buy it was the pictures of the constellations! I really love the photos because you don't really see those everyday in my country!" Barcoded and ready for sale! A HUGE thanks to the incredibly talented Colin Gailey for scoring the video. He wrote that song just for the video! Please check out his music on SoundCloud! Another huge thank you my family for all the love, support and encouragement. To everyone I work with at The Loft at 600 F (the beautiful event space in the video) and TE. And to all my friends who have given such generous and thoughtful feedback and to those of you pledging your support today! Welcome to Team GetAstrological! Without all of you this project would still just be files that are... in the computer?! PS. Everyone I've talked to so far either wants a calendar, or knows someone who they think would want a calendar. So please send friends to GetAstrological.com - they will land right here on the Kickstarter campaign, and then to whatever happens next after the campaign is successful! As of now I have all 12 zodiac pages drafted with a quarter of the year nearly finished. During the campaign I'll be working on finishing those up, ensuring they are press ready, double checking my astrological research, and updating the campaign and backers with final designs along the way. I expect to have this all completed by the first week of Pisces and I have already received samples from a New York based printer lined up to produce the calendar, and am investigating potential alternative vendor options too. Like with all projects that require production, the biggest foreseeable issue is if there are delays in printing and not being able to get these awesome calendars out around the the start of Aries (March 21st). Also if there are so many calendars that I can't quickly ship them all myself. But my family is ready to help, and I also have Amazon 3rd party fulfillment in mind as a backup plan. Also, the unexpected arrival of Gozer the Gozerian. Clear your heads! A conversation piece for the well-lit wall where this new calendar wants to live. You will receive one copy of the first officially printed edition! And then a second to give as a gift, or to keep unopened in mint condition. Will arrive individually shrink-wrapped. For gifts or perhaps on display near a cash register anywhere calendars are sold. Help in my quest to disrupt the ancient Gregorian calendar market with this even more anciently inspired calendar! A signed, 12x12" giclée fine art print ready for framing of one of the 12 zodiac images of your choosing. It will really tie the room together... astrologically. Also includes the first edition of the calendar! Introducing the AstroPrint Plus: a signed, 20x20" giclée fine art print ready for framing of one of the 12 zodiac images of your choosing. Ships protected in a cardboard tube. Will also include the first edition of the calendar! We'll study the charts and curate my unpublished aerial archives to highlight different images and important dates and then print up to 10 copies of this personalized calendar for you, for the Sun's next trip around the Zodiac in 2016. I will charter a single private flight or helicopter tour, in a mutually agreed upon flight path and a mutually agreed upon time somewhere in the continental US before Aries 2016. You will join me on this flight to photograph a new series of aerial photos from exceptionally low earth orbit*. This is an individual workshop reward for just one very adventurous astrological pioneer. All photography gear will be provided. Your travel and accommodations to/from agreed upon flight location is not included. The focus will be on the very special flight and will help fund my digging into Get Astrological for a further 3 years! *Note: Height of orbit subject to FAA and probably some other regulations. You may now turn on your electronic devices.